The global diaper market for infants and the elderly is growing. This has been driven by rising standards of living in populous countries like China and India. Manufacturers are meeting the challenge with innovative technologies. The baby diaper vertical is expected to reach US$ 70.4 billion by end-2024, up by 4.1 per cent. 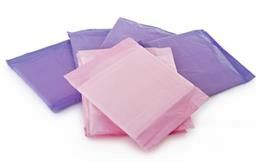 Growth in the adult-diaper market is outpacing that of every other paper-based household staple, due in part to an ageing population but also due to the elimination of the stigma of using such products. According to Global Market Insights' industry analysis report, the disposable incontinence product market size was over US$ 8 billion in 2015 and is expected to exceed US$ 12 billion by 2024. Not only is the need for diapers and incontinence products increasing, consumers are demanding more comfort and performance. Manufacturers are using innovative new technologies, producing disposable diapers and underwear with softer, lighter and smoother fabrics that are constructed to fit well with high elastic functionality. 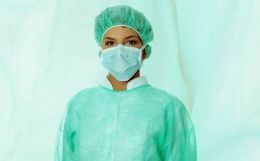 Research and development in the properties of nonwoven fabrics has thrown up choices ranging from crisp to fluffy, abrasive to soothing, and tearable to extremely durable. With so many options in fabrics and the technologies to convert them, manufacturers have a lot to choose from. Some conventional methods for fabricating elastic nonwoven materials include bonding elastic strands between layers of nonwoven fabric with adhesive when elastic strands are under tension. 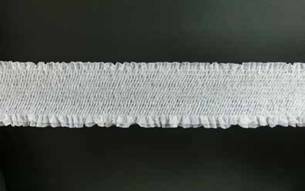 Once elastic strands are permitted to relax, areas of the nonwoven fabric are gathered such that the nonwoven fabric functions with elasticity. However, durability of elastic nonwoven materials made using conventional adhesive methods is less than desirable because adhesive bonds are prone to creep, which can result in loss of elasticity. 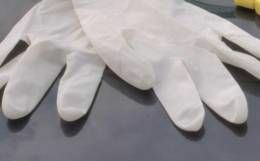 Moreover, it can be overly expensive to fabricate elastic nonwoven materials with these conventional techniques. So, it became useful to provide a system for fabricating a more durable elastic nonwoven material in a more cost-effective way. Fig. 1: Typical configuration of a 30 kHz continuous bonding module. Aurizon Ultrasonics offers a patented rotary ultrasonic elastic entrapment apparatus (Fig. 1) that enables manufacturers of nonwoven products to create softer, thinner, high performing elasticised fabrics. This innovative solution is changing diaper design by providing precise bonding on waistbands (Fig.2) and leg cuffs (Fig. 3) without the stiffening effect of adhesive. 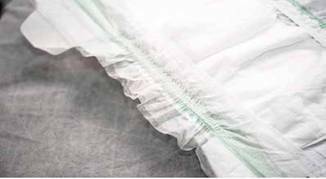 With the elimination of adhesive, the ultrasonic elastic entrapment process makes it possible to construct diapers using technologically advanced nonwoven fabrics that are thinner and have better absorption, allowing converters to create an elasticised fabric with improved drape, bend, crush conformability, breathability and maximum performance. Fig. 2: A 16 strand elastic strip created using the elastic entrapment process. Fig. 3: Elasticized leg cuff on diaper showing intermittent bonding using the elastic entrapment process. Fig. 4: The ultrasonic process creates bond points within the nonwoven material that surrounds the elongated, smaller diameter elastic strand. The ultrasonic process uses a rotary ultrasonic horn and a rotary anvil in close approximation to the horn with elastic sandwiched between sheets of nonwoven material. In contact with the horn, the face of the anvil creates bond points within the nonwoven material that surrounds an elastic strand that has been elongated. Therefore, it is smaller in diameter than a relaxed strand. When the strand is relaxed, the elastic expands and becomes entrapped between the bond points (Fig. 4). Slip or creep, problems common with applying elastic using adhesives, are eliminated. Ultimately, Aurizon's ultrasonic entrapment technology provides lower tension at elongation compared to premium branded diapers bonded with adhesive. This attachment technique has minimal impact on pure elastic strand performance allowing a compromise between reducing stiffness of a strand under tension and maximising elongation (Fig. 5). Ultrasonic technology offers many benefits by itself, such as increased operational efficiency, material cost savings, improved product comfort, better elastic performance and increased sustainability. Increased operational efficiency - By eliminating cost of operating and maintaining the adhesive applicator equipment, labour and utility costs will decrease. Adhesive application processes require significant amount of effort, expensive spare parts and labour to maintain. Adhesive overspray and strikethrough need the converting line to be stopped regularly for cleaning. Each delay results in lost production time and creates a waste stream. Material cost savings - Ultrasonic technology is saves cost with the option of purchasing less expensive, lighter weight nonwoven materials and elastics because there is no need to worry about adhesive bleed-through or loss of elastic performance due to stiffening effect of adhesive. Fig. 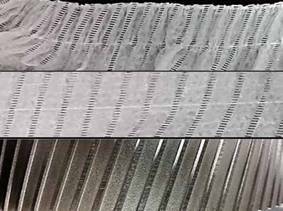 5: Views of converted elasticised nonwoven fabric samples created with 680 decitex elastic fibre, 13 gsm SMS on a 30 kHz bonder at 457 mpm. Top view: fabric without tension. Middle view: fabric stretched. Bottom view: multicrevice pattern on the anvil surface. Improved product comfort- Eliminating adhesive allows the finished product to be softer and more breathable. Lighter weight fabrics can be used so the final product is thinner and shows less when worn. Stretch performance-Ultrasonically bonded attachment points reside close to non-attached elastic strands, allowing for near pure performance of the elastic. Increased sustainability-Ultrasonic bonding takes less energy because it replaces hot melt delivery and application systems with highly efficient ultrasonic energy source. There are fewer toxins in the landfill when the product is discarded. Aurizon's low maintenance design has a long service life and is based on patented rotary sonotrode with a rigid flange. 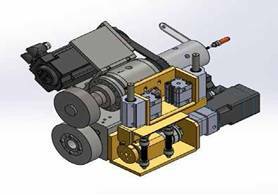 The rotary feature delivers high speed, robust solution designed to work through process and web upsets. Machine components can be adjusted for both continuous and intermittent processes. High speed-The rotary ultrasonic feature allows for high speed conversion of the fabric as it feeds through the process at speeds of up to 600 mpm. Robust solution-Rotary action combined with proprietary anti-snapback device keeps the process running smoothly and avoids upsets such as nonwoven splices, elastic splices and machine stop/start. Custom design- System can be retrofitted to existing process. Customised configurations possible. The progress in ultrasonic technology will be just as applicable for other new developments in nonwovens including "smart" fabrics, home wraps, geotextiles and protective apparel. It has already been proven to be suitable for applications that require bonding lofty layers with a powder fill or when bonding fabrics with different compositions together. There are many more possibilities that have yet to be discovered. 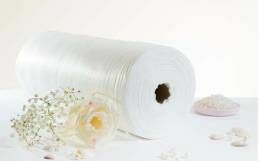 References:  Olivio, Tara: The Baby Diaper Market, Nonwovens Industry, http://www.nonwovens-industry.com/issues/2017-01-01/view_features/the-baby-diapermarket-395612/, last view May 23, 201. Hymowitz, Carol; Coleman-Lochner, Lauren: The Adult Diaper Market is About to Take Off-Sales of Adult Incontinence Garments in the U.S. Could Equal Those of Baby Diapers in a Decade, Bloomberg Businessweek, https://www.bloomberg.com/news/articles/2016-02-11/the-adult-diaper-market-is-aboutto- take-off, last view May 23, 2017. Global Market Insights: Disposable Incontinence Products Market Size, Industry Analysis Report, Regional Outlook (U.S., Germany, UK, Italy, Russia, China, India, Japan, South Korea, Brazil, Mexico, Saudi Arabia, UAE, South Africa), Application Development Potential, Price Trends, Competitive Market Share & Forecast, 2016 - 2024,https://www.gminsights.com/methodology/upcoming-detail/disposableincontinence- products-market, last view May 23, 2017. Ehlert, T.; et al. : United States Patent Application Publication, Apparatus for Fabricating an Elastic Nonwoven Material, Aurizon Ultrasonics, LLC, Kimberly, WI (US), Application No. 14/951,884, Publication US 2016/0288407A1, October 6, 2016.